Would prefer local sales and collection, but the motorcycles can be shipped abroad if required at buyer's cost as I have experience in doing so. Suzuki RGV250 VJ21. 1991 rare early model. One of only 500 ever made using the Aprilia engine with bigger carbs, etc. and highly tuned. Navy, blue and white. This one is nearly all original and benefits from a light recommissioning including wheels painted back to original colour. Possibly the lower fairing has been painted at some stage. Good tyres, exhaust and brakes. Was MOT'd. Requires registration which can be done prior to sale if the full asking price of £8,500 is paid. Can only rise in value due to the rarity of this classic bike. Would prefer selling as is, but can export abroad if required (experience in doing so) at buyer's cost.Offers around £8,500. Honda Z50A Mini Trail 1972, unregistered. About 919 kilometres mileage from new believed genuine. This bike has been fully restored, including all paintwork and is in good running order. Chrome work, tyres and seat excellent. This model has quick release front forks and wiring for easy transporting or storage. Offers around £3,500. HONDA CBRF 1000 1995 "N" reg. Sometimes known as the Jelly Mould model (forerunner to the Blackbird). 30,000 miles from new, Red, white and blue. Totally original including exhaust system, recent new tyres and new £300 adjustable shocker rear suspension unit. ABS brakes. All fluids changed. Spare key. Nearly the full service history with MOTs and receipts. Service book with complete set of invoices for work ever done. Has had 6 owners. Did run, so just wants using. Stunning condition and one of the best examples around. Offers around £2,500, will accept £2,250. Kawasaki Z1R, 1979. The previous 20 year old owner has completely restored the bike with every nut and bolt in stainless steel. Frame powder-coated, new discs, recent tyres. Highly polished and painted rims and front forks. Chrome indicators, no fairing, Z900 clocks. However not original, as currently I have the original exhaust front pipes, fairing fork brackets, speedo brackets, new speedo and rev counter, fairing x 2 with new screens, fairing surround for clocks, 4 black indicators, battery gauge 00, 4 original front pipes, headlamp complete and collector box, USA copied expensive silencer. Marshall full exhaust system. This bike also has its original larger capacity fuel tank and a smaller tank. Offers in excess of £10,000. 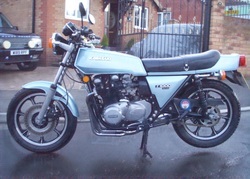 I also have a 1980 Kawasaki Z1R (NOT SHOWN) in stunning running condition which can have a new MOT. Lots of recent work carried out by a main dealer including latest expensive original copied silencer from California and front pipes fitted. Big tank fitted, upgraded discs, front pads, new full exhaust system, new tyres and brakes. No offers £15,000 won't find a better one. 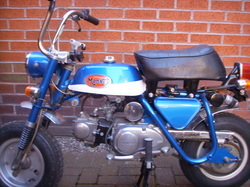 Suzuki Beamish 350cc. Unregistered (1978). This bike has had a full engine rebuild. Requires running in. All new paintwork, mudguards, new tyres. Twin shocker model. All alloy rims polished. At a local classic dealer, not on site. Offers around £3,000. Norton Interstate 850cc electric start 1978. Registered 5 December 1977. This is an incredible unmolested bike which will require light recommissioning. 9,000 genuine miles and 2 owners. Full documents and service booklet and wallet from dealer with original purchase receipt. Larger tank model. Electric start. Gear change on left. Matching engine and frame numbers. Alloy casings and complete bike never painted. Brand new TT100 Dunlop tyres fitted, 2 new stainless steel chrome wheel rims and stainless spokes. New stainless steel exhaust pipes. New Norvil supplied Black Cap silencers. That's all that has been needed in 40 years. I have as spares original Dunlop rear wheel rim and original dealer number plate from Tooting, London. The bike is tax exempt and just a new MOT required. Offers around £10,000 which is cheap compared to other examples. At a local classic dealer, not on site. 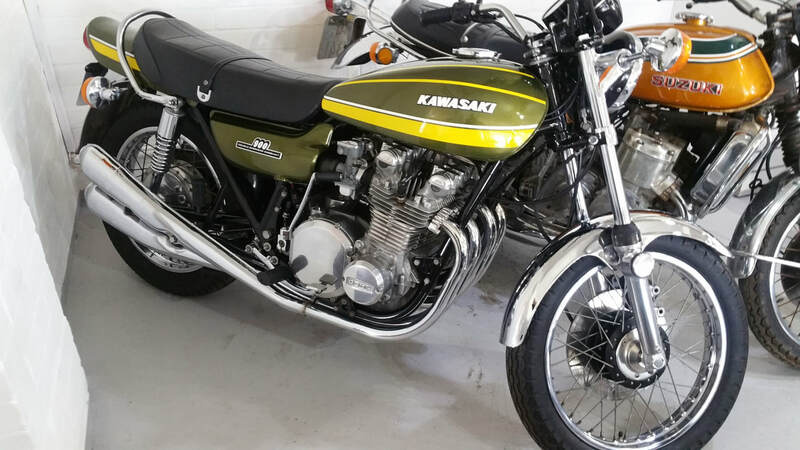 Kawasaki Z1 900 (!A) 1974. UK model. Fully restored by previous Jersey owner/collector, Kept in this country to keep original number plate. Stunning condition throughout. Requires nothing doing to it just exhibiting at classic shows, etc. Not on site, at a local classic dealer on display. Offers around £20,000. Ducati Bevel 900SS 1980. One off special with nickel frame. Engine built in America from some of its history. Purchased from a well known Leicester-based local family business. This one has lots of extra chrome and a 2-1 Corsa-type exhaust system. A Leicester mechanic says this the engine set up is one of the best he has ever seen. Has been to the Cholmondeley Festival of Speed. Requires nothing. Total investment will go up in value. At a local classic dealer. Price £24,995 no offers. Ducati Mike Hailwood replica 900SS Bevel 1980. One of the first batch made of 300. Totally original in every but benefits from braided brake hoses, wheel rims repainted gold, full fairing repainted due to being 38 years old and frame repainted due to dullness. Less than 16,000 miles from new. Currently at the dealer I purchased it from some 12 years ago. Ready to ride away or store. Future and current investment. Offers around £22,500. Triumph Silver Jubilee 1978. One of only 1,000 made. Requires light recommissioning, mainly brakes/calipers/battery etc. This could be done at additional cost. Some extra parts available - side panels, tank, alloy casings. New 7 plate clutch fitted. Lots of genuine history, invoices, heritage certificate and first purchase invoice from Scarborough dealer. Price on application. 1995 Gold Monkey bike model 50J. PHOTO TO FOLLOW. This one is a limited edition with 80cc Kitaco conversion kit. 6,000 kilometres done. A must for any serious monkey bike collector. Runs/ride away. Recently replaced every genuine Gold item. Purchased from Monkey BIke UK Leamington Spa. £6,000 no offers.